Restaurant Bouillon Chartier is a Paris institution, and one visit will show you why. Ever since it was first opened in 1896 by the Chartier Brothers, through 122 years and over 50 million meals served by only four owners, the restaurant has strived to live up to the Chartiers’ original mission: offer a meal worthy of the name at an affordable price and give customers good service to earn their loyalty. And loyal they are. While Restaurant Chartier has found a place on the tourist map, everyday Parisians also still flock here throughout the day. If you find yourself in Paris, you should follow them. Yes, you definitely should. 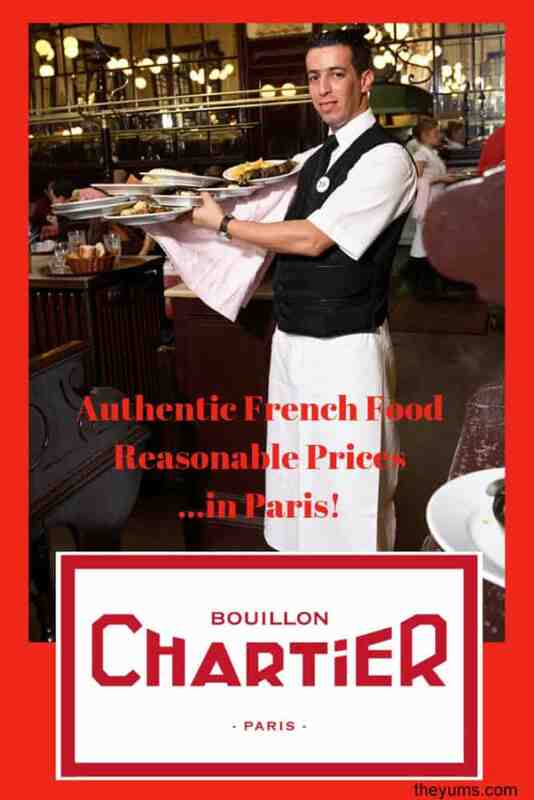 Menu: Bouillon Chartier features old-fashioned, authentic Parisian brasserie dishes. Such everyday classics as escargots, terrines, steak frites, roasted chicken, steak tartar, and tête de veau with a tangy sauce gribiche fill the long menu. A variety of cheeses and a nice choice of traditional desserts finish it up. Location: 7 rue du Fauboug Montmartre, in the 9th Arrondissement. The nearest Metro stop is Grands Boulevards. Thoughts: Despite the fact that the room itself, in all it’s Belle Epoque splendor, is drop-dead gorgeous, the service and ambience at Restaurant Bouillon Chartier is the opposite of pretentious. It’s noisy and busy, a hubbub of carefully choreographed chaos, making it a mirror of the real Paris. Everyone comes to Chartier. You’ll be rubbing elbows—and possibly sharing your table and bread basket—with native Parisians and provincials, seniors and university students, backpackers and Bohos (Paris’ answer to Brooklyn hipsters), and more than a few tourists who are on to the secret. Bouillon Chartier is located on the busy Rue du Fauboug Montmartre. Look for the red sign and the big red double doors. They open into a passageway that widens into a cobbled courtyard some 70 feet wide before the actual entrance to the restaurant. The place is extremely popular, and they do not accept reservations, ever. So there may well be a line at the door. To avoid as much waiting as possible, try to arrive by noon for lunch and by about 6 or 7 pm for dinner. They’re open 7 days a week, 365 days a year and don’t close until late in case you’re hungry after an evening out. Once inside, you’ll discover the space is a perfectly preserved slice of Belle Epoque Parisian history. It’s even been listed as a National Historic Monument since 1984. Edith Piaf ate here. So did Maurice Chevalier and Mistinguett, the most famous entertainer in France at the beginning of the 20th century. They would recognize the place today in a flash. Virtually unchanged since it was created, the room is a huge and elegant barn of a place, over 3000 sq. ft.
With a high glass ceiling, tall multi-paned mirrors on the walls, glass-globe chandeliers and soaring pillars adorned with gilt carvings, it’s crane-your-neck beautiful. The walls are lined with wooden armoires with tiny, numbered drawers. There the regulars once stored their personal napkins and silverware, to await their next visit. Conversations echo through the large space, and century-old memories seem to rain down. Scurrying through this space like busy dancers are the waiters (and now also waitresses), traditionally dressed in long-sleeved white shirts, multi-pocket black vests, black bow ties, and long, starched white aprons. They slide between the close-set tables balancing as many as a dozen dishes on a single tray, delivering baskets of bread and carafes of water. Once you are past the line and through the revolving doors, your waiter will lead you to a table. If you are alone or half of a couple, expect to share that table with strangers. Some may be chatty, others will not. Toss your coat or other accouterments in the brass-rail rack above the tables and take a seat with a pleasant nod and a soft “Bonjour” or “Bon Soir” to your tablemates. Note: the basket of good baguettes placed on the table is also part of the sharing routine. Help yourself and pass it along. When the waiter takes your order, he’ll write it on the paper tablecloth. That’s also where he will add up your final bill when you’re finished. The service is extremely efficient and generally friendly and helpful, although they can be understandably a tad impatient if you take a long time to make up your mind. But what about the food? It will be good. Likely not the best meal you’ll have in Paris, but good and filling and very French. It will be the kind of food Parisians have been putting away forever. I’ve been to Restaurant Bouillon Chartier at least three times over the years, and I’ve never regretted the food. For a quintessentially Parisian experience, you might want to start with the escargots, six per order in pools of green, garlicky butter. Or try a Salade frisée aux lardons topped with crisp bacon and croutons, or leeks in vinaigrette, celery remoulade, or a country terrine. From there, you might move on to steak frites in a green peppercorn sauce, choucroute (sauerkraut) Alsacienne, a grilled andouilette (an extremely stinky sausage made with pork intestines, an acquired taste I have clearly not acquired! ), or a duck confit with potatoes, plus many other options. Follow that with an order of cheese or one of a dozen luscious desserts. Pick something light like fresh pineapple or a palette-cleansing sorbet, or go all in and get the famous baba au rhum, sweetly drippy and topped with fresh-whipped chantilly cream. I was delightfully surprised with the pruneaux au vin—prunes soaked in wine and served with vanilla ice cream. For a full blow-out, end your meal with the chou glace vanille chocolat chaud; you’ll be brought an airy profiterole cream puff stuffed full of vanilla ice cream and flooded with hot chocolate sauce then topped with almonds. Parisian decadence at its best. Restaurant Chartier has a full bar, is wheelchair accessible, and accepts most credit cards. It is the best value for money combined with such tradition in all of Paris. Price Range: Bouillon Chartier defines affordable, especially for an expensive city like Paris. You won’t find this kind of genuine, old-school French food anywhere else in the city at a better price. You can order a single bowl of the thin house vegetable consommé, with vermicelli, for a single Euro. Starters range from €1-6.80. Main dishes are €8.50-13.50. Cheeses are €1.90-2.60. Desserts are €2.20-4. It is entirely possible for two people to have two main courses, two desserts and share a half-bottle of wine for well under €40. I’m headed to Paris for 24 whole hours (I know, I should’ve extended the trip for longer) at the end of the month and have been looking for a great place to have a meal – I think Bouillon Chartier fits the bill!